Between coaching the Stingers women’s hockey team and playing for Les Canadiennes, Julie Chu doesn’t have much free-time. Monday is almost considered to be her “day-off,” even though she still has to lead a Stingers practice at night. She has practices Monday through Thursday—in the morning with the Stingers and the evening with Les Canadiennes—with video sessions in between and games on the weekend. With the new head-coaching job, Chu took the decision to go from a full-time Canadiennes player to a part-time one. “I am getting older and am starting to shift into wanting to run my own program,” Chu said. Chu is returning as head coach of the Stingers this upcoming season—beginning on Oct. 14—and it’s a position she is prioritizing this year as her playing days are coming to an end. For the past two years, Chu has been actively involved with the women’s hockey program at Concordia, starting off as an assistant coach under Les Lawton for the 2014-15 season. When Lawton was forced to take a medical leave of absence last year, it was Chu who took over the reins. Chu will not be hanging up her skates for good. She will be patrolling the Montreal Canadiennes blue line for a seventh straight season. 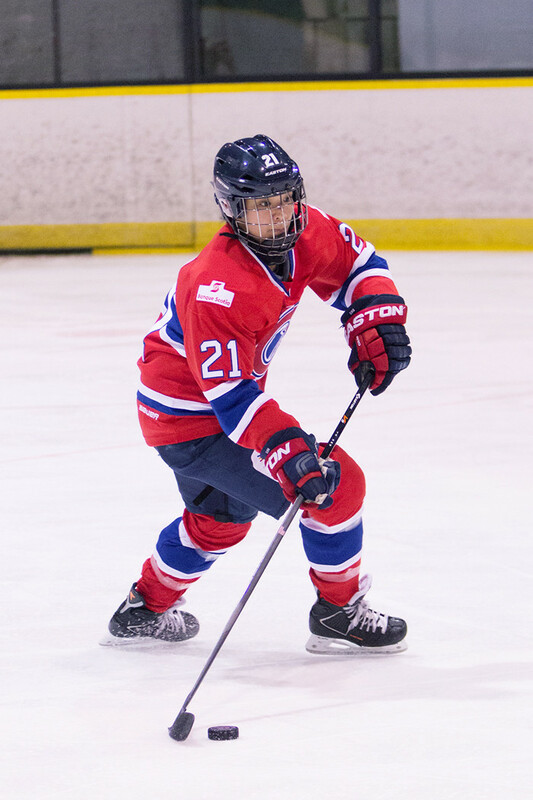 Chu will play for Les Canadiennes part-time when her schedule at Concordia permits. There will be ten occasions when her coaching schedule will conflict with her playing for LEs Canadiennes. Her duties at Concordia will take precedence. Juggling both jobs takes up a great deal of Chu’s time. A closer look inside her weekly schedule showcases a long list of tasks, responsibilities and commitments that she must fulfill. Such a hectic lifestyle is not unchartered waters for the 34-year-old. She was an assistant coach in the NCAA with the University of Minnesota Duluth Bulldogs from 2007-2010 and with the Union College Dutchwomen from 2010-2013 while still training with the U.S. National Team. Chu suggests that occupying both roles simultaneously has made her more appreciative of the sacrifices being made by Les Canadiennes coaching staff. She realizes that decisions as to who comes in and out of the lineup and the amount of ice-time a player receives are not taken lightly. “I am able to understand the big picture that coaches are looking at when they make decisions,” Chu said. The Bridgeport, Connecticut native also says she has benefitted as a coach through the process. She is up-to-speed with present-day hockey and the current systems being used in the game, she explained. Boivin believes that Chu’s previous experience as a player at Harvard and as an assistant coach in the NCAA will benefit her as the new Stingers head coach. “She understands what student-athletes are going through as they balance both academic and athletic responsibilities. As a result, she has been able to alter her coaching techniques, acting as ‘a mentor and guide’ to her players,” said Boivin. Chu is grateful for the support given to her by Les Canadiennes organization, from the players to the coaches and front-office staff. Whether near or far from the team, the club understands Chu’s mindset. she would be suiting up for Les Canadiennes or fulfill her head coaching duties with the Stingers. She’s waiting to see where her team is at in their preparation. Chu is looking for growth amongst her Stingers players over the coming season. She wants to see her team capitalize more on their scoring opportunities and become an offensive juggernaut in the conference. Boivin is also looking for progression this year. He likes their chances to consistently beat both the Carleton University Ravens and the University of Ottawa Gee-Gees within their conference. He also recognizes that the McGill Martlets and Université de Montréal Carabins pose more of a challenge. But Boivin is confident the team can succeed against the local-area teams, and improve their record and playoff results in the process. Chu was coy when asked about how much longer she intends on playing, preferring to analyze the situation on a yearly basis, but one day soon it seems her energy will be entirely devoted to winning a championship with the Stingers. The Link refereed to Julie Chu’s team as the Montreal Canadiennes in the title when the name is Les Canadiennes. The Link regrets that error.